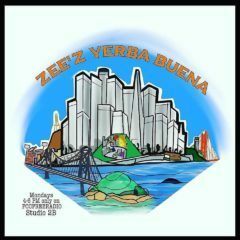 Zee’z Yerba Buena #34 – Radio for the People, by the People. Hey Hey Hey!!! Zee here on another beautiful Monday in San Francisco getting ready for another Zee’z Yerba Buena!!! I’ll recap another awesomely hilarious Tuesday’s Child on Wednesday!!! Ya that’s right I said awesomely, not sure if it’s a word but I’m using it! We had such a good time at Moonlight Cafe!!! (tickets here) Don’t miss our next show on July 18th! Our musical performer from last week, Peter Feliciano might pop in today and hang out! Otherwise I’ll just be playing some music and talk about what a great show we had and recap my Sunday afternoon at Stern Grove!!! Be sure to tune in live today at 4pm from Studio2B!!! Only at FCCFREERADIO.COM Download the app!! !